I know, everybody wants to lower the ride height - except me. 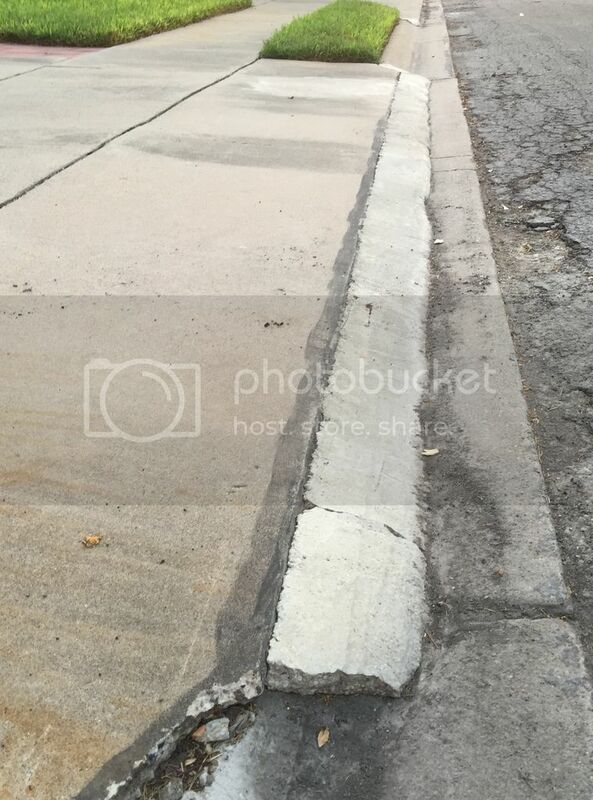 The 1950's curbs at my house are about 1/2 inch too high. If I could find a way to raise the height of the car just an inch, it would be a whole lot easier to let passengers in and out. I'm not sure it is even possible. Any thoughts? I feel your pain. My Flex, which I lowered, has this issue whenever I drive it in LA. Taller tires when you replace. Also need to make sure they don't rub inside the fender but even a little gained here could help. Wedge delrin type blocks between the spring coils to keep from compressing. Best to to this with each wheel of the ground. Can have a negative impact on ride quality. Put the fatter people on the driver's side. Don't know if there are any air bladders that might work. I put these in my Flex to compensate for great load when i have a trailer and they raise the car quite a bit in the rear when unloaded. These are just some of the ideas I could quickly come up with. Use at your own risk of course. I have used all methods listed with varying degrees of success. I just didn't tell my passengers I was putting the larger ones on my side. I just said it was for "weight and balance" since I am a long time pilot and left it at that. Nobody asked any more. Or course I am the biggest anyway and since I am driving I am in the right place to begin with. Tires would be the easy way to change it. Run a different rim with a higher profile tire. Edited by drdiesel1, 15 September 2015 - 12:36 PM. Wouldn't that mess up the speedometer, and is there even room for that? Ah, Weights and Balances. That brings back memories of my AF days. I was part of a radar squadron and our mission would involve air deployments. We had to measure the weight of all four corners of every piece of equipment, and then mark the center point (plus the weight of course). That was a real chore with 120 or so vehicles and tows, and it had to be done in real time, just before we got to the flightline, so that the weights were actual, not predicted. Smooth out/raise the curb-street junction. My neighbor did it for his mustang. Yep! You could correct for it with a Scan Gauge II, IIRC ? The sensors warn me if I'm approaching the curb. Feelers won't help me open the door! I haven't asked him if it was DIY or had a contractor do it. My former Volt had a very, very low front air dam and scrapped so loudly that I removed it the first week of ownership (it was an easy removable/replaceable item) but I have no issues with the CMax. Oh, I see what you meant. No, that would not work; the street parking is not assigned, and the neighbors also have small cars, so they would park in front of my house. OK my bad, the street parking didn't registered with me when I read the OP. How do you charge when parking on the street? I park in the rear to charge (next to my garage), and there is no problem getting in/out there. But I drop the kids off out front first, and my parents-in-law also have a very high curb. So it is a daily annoyance. just pull up in front of the driveway? Oh, I'm sorry. My post did not contribute to the conversation, so I apologize for that. To post something more appropriate, if it's in front of your own house and not an unfamiliar location, shouldn't you remember the curb is high and warn folks using the passenger side door to be careful when exiting, or if that's not possible, let your passenger off away from the curb, then pull to the curb to park. Of course, you will have to reverse the procedure when boarding your passengers who enter on the passenger side of the vehicle. Another option would be for Ford to recognize the need to raise the vehicle height for the handful of owners who have high curbs in front of their homes and communities, or the same owners could trade in their C-Max for a higher riding SUV (Expedition) and never have to worry about curb height. Sounds like yet another good reason that Ford should expand the use of the Energi drivetrain into more vehicles. An Escape Energi would probably be pretty popular! That is the exact thing I do. It is a pain to have to pull out, load or unload, and then pull back in. I would have been all over an Escape hybrid if it had been offered. I had an Escape Hybrid before my Energi.